These were so good – the photo doesn’t really show it, but trust me they’re so yummy! They’re simple and easy to make and fairly healthy too. We all loved them and I’ll be making them more often. They’re also the perfect lunch for my daughter to take to school with a cup of salsa. Preheat oven to 350 degrees. Drain and rinse beans and place them in a microwave safe bowl. Microwave them for one minute to soften beans. Mash with a fork; add salsa and taco seasoning and mix well. Lay 3 or 4 tortillas on a baking sheet. 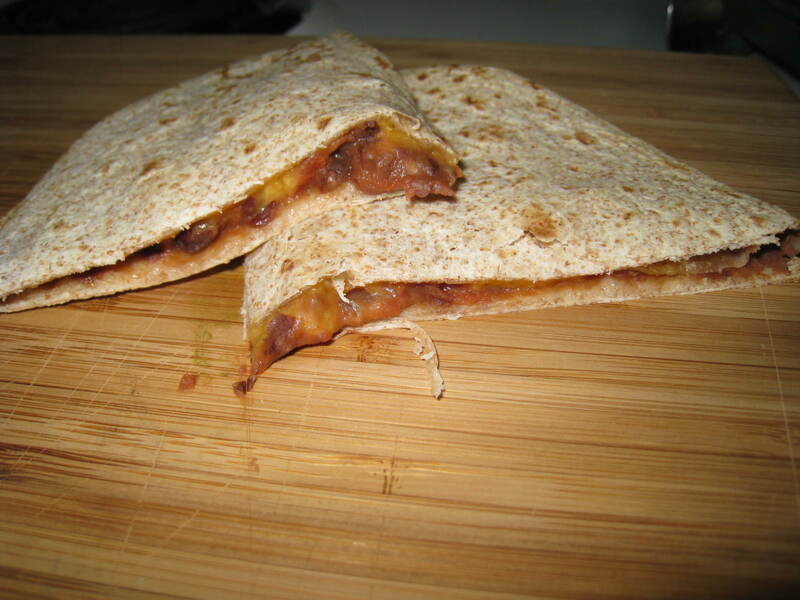 Spread bean mixture evenly on tortillas. Sprinkle with cheese and top with remaining tortillas. Bake for 10 minutes until cheese is melted and tortillas are crisp. Let rest 1 minute before cutting in quarters.